I’ve made no secret of my inability to bake. I have burned sheet after sheet of misshapen cookies and pulled countless cakes from the oven that failed to rise. A few years ago, after yet another bundt cake that had somehow been Super Glued to the pan, I threw both pan and cake into the trash — a very liberating experience. Then there was the Fall that I was going to teach myself to bake my favorite cake, the Black Forest Cake. Yum, right? The first attempt quite literally made me sick. I couldn’t get that thing to the trash quick enough. The next week brought another attempt. That “cake” was better — it wasn’t life-threatening — but was certainly nothing to be proud of. The third cake proved I was on the right track, though it was in no way good enough to share with anyone. I hit pay-dirt with my 4th and, what would prove to be, my last attempt. That cake was a delight. Good thing, too, because that was 6 years ago and it was the last Black Forest Cake that I’ve tasted. Oh, I’ve been tempted to have a piece but, when I am, there’s a rumble down under that convinces me that now is not the time. Perhaps it was my success with this torte that gave me the mistaken opinion that I could bake, leading me to the Black Forest Cake debacle. I first saw Jamie Oliver prepare the torte when he was known as The Naked Chef, so, this recipe has been around for some time. I’ve made it a number of times since without any problems whatsoever — not counting a misguided attempt to make it as a bundt cake with that accursed pan. Never mind that. Believe me. If I can bake this torte anyone can. Now, a word about the recipe before proceeding. If you go searching for it on the web, you’ll find it titled a number of ways. Jamie Oliver’s: “Chocolate Torte”; “Flour-less Chocolate Torte”; and, “Two Nut Chocolate Torte”, are the most popular. Bear in mind that this recipe was demonstrated in an episode that aired in 2000, some time before most of us were aware of gluten-related issues. In fact, I’ve even see the recipe called “Flour-less” yet you’re instructed to grease and flour the pan before filling it with cake batter. Not to worry. 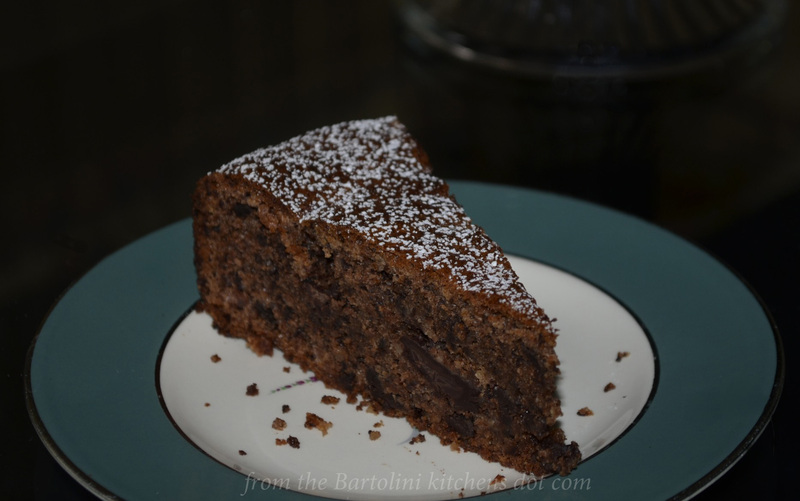 This torte is gluten-free, hence the name change, and I coat the pan with powdered cocoa, not flour. Pre-heat the oven to 375˚ F (190˚ C). Use butter to grease the bottom of an 8 to 10 inch spring-form pan before lining the bottom with a piece of parchment paper. Butter the paper and sides of the pan. Use cocoa powder to coat the greased pan. Place the almonds into a food processor and grind them until finely ground. Add a pinch of salt and 2/3 of the chocolate and process for 30 seconds. Remove the nut-chocolate mixture to a large mixing bowl. Add the butter and sugar to the food processor and run until the mixture is a pale yellow and fluffy. Add the egg yolks, one by one, and process until well-blended. Add the egg mixture to the bowl with the chocolate mixture and stir until well-combined. 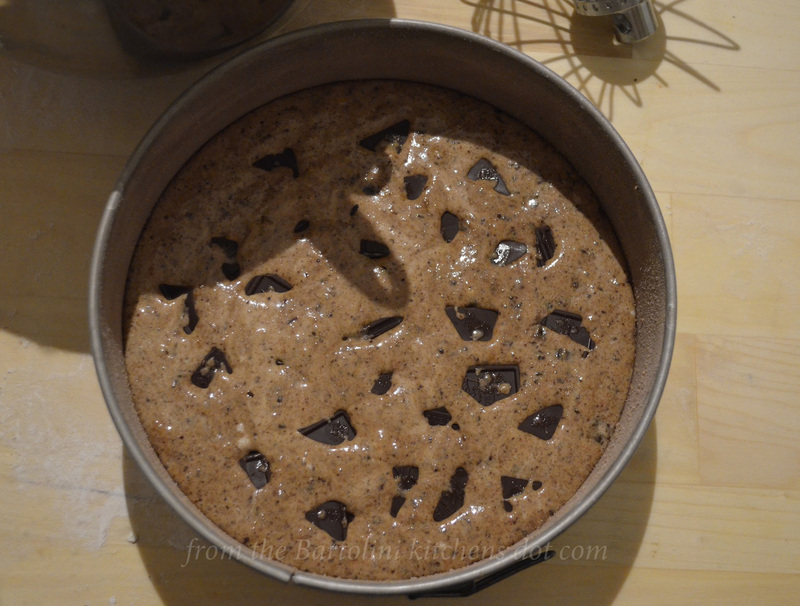 Place the remaining chocolate chunks into the top of the torte’s batter. Press them slightly into the batter, though no need to cover them with batter. Bake on the center rack of a pre-heated oven for about an hour. After 55 minutes, use a knife to check to see if the torte is finished. Place the knife into the center, wait a few seconds, and remove. The blade should be relatively clean. Once cooled, remove from pan, invert to remove the paper, and place on a cake platter. Dust with powdered sugar. Serve as-is or with a dollop of whipped cream or crème fraîche. Be sure to keep an eye on your nuts when using the food processor or you may end up with almond-walnut butter. To remove the almond skins: Add raw, shelled almonds to a small sauce pan filled with boiling water. Remove from the water after 3 minutes, placing the blanched nuts into an ice water bath. Strain and wipe dry. Squeeze each almond between your thumb and index finger to easily remove the skin. Bring eggs to room temperature before separating. Be sure no yolk remains in the whites. Place the whites in a mixing bowl. Whether whisking by hand or using a mixer, begin slowly at first. After about 30 seconds, continue beating at medium speed. Once the eggs begin to color, beat at a higher rate until beaten to the recipe’s needs. The beaten egg whites provide lift for this torte. If they aren’t folded into the batter correctly, the torte will not rise. Here’s a quick video demonstrating the proper technique for folding egg whites into batter. Heat 10 oz (300 ml) of heavy cream to the point of boiling. Pour the heated cream over the chocolate and let sit for a couple of minutes before stirring until smooth. As it cools, the ganache will thicken. Either pour the ganache over the entire cake or each piece as it is served. I usually make half the amount listed here and store the remainder in a sealed container in the fridge. I’ve no idea how long it will last because kitchen elves snack on it until it’s gone, usually within 48 hours — within 72 hours when Girl Scout cookies are atop the counter. Carnivale ends today in Italy, as it does round the World. In the days leading up to Ash Wednesday, the beginning of Lent, celebrations of all kinds take place, each with its own particular sweets and confections. In New Orleans, it’s King Cake. In Chicago, it’s fried donuts called Paczkis. 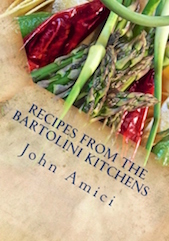 In the Bartolini kitchens, it was fiocchetti, which we called angel wings. 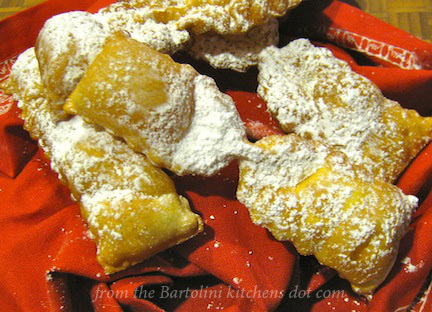 These fried dough crisps, in one form or another, are made throughout Italy this time of year and go by a number of names. You can learn how to make them just by clicking HERE. This is one of the recipes I brought home with me following my last visit with Zia but its path to this blog is nowhere near as direct as that statement makes it sound. While having coffee with Zia, I mentioned that I baked a wonderful apple cake two years ago but have since lost the recipe. Try as I might, I can neither find nor duplicate that cake. My story reminded Zia of a slice of cake she was once served at her Daughter-in-Law’s home. She complimented my Cousin and asked for the recipe. 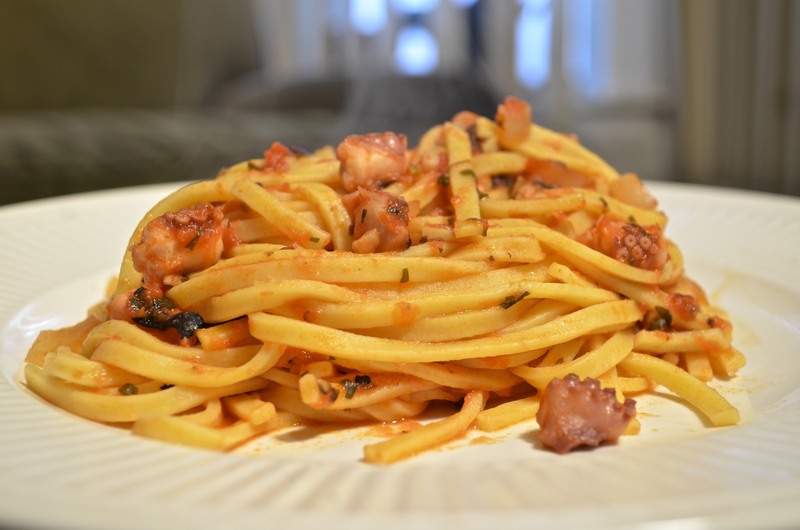 Surprisingly, the recipe came from the other side of my family, my beautiful Zia Mariolla, who’s married to my Dad’s youngest Brother, Zio Leo. I’ve no idea how the recipe got to my Cousin’s cookbook but, lucky for us, it found its way into mine. Perhaps what I like most about this cake is that it isn’t overly sweet and, in that regard, its lack of icing is a big plus. 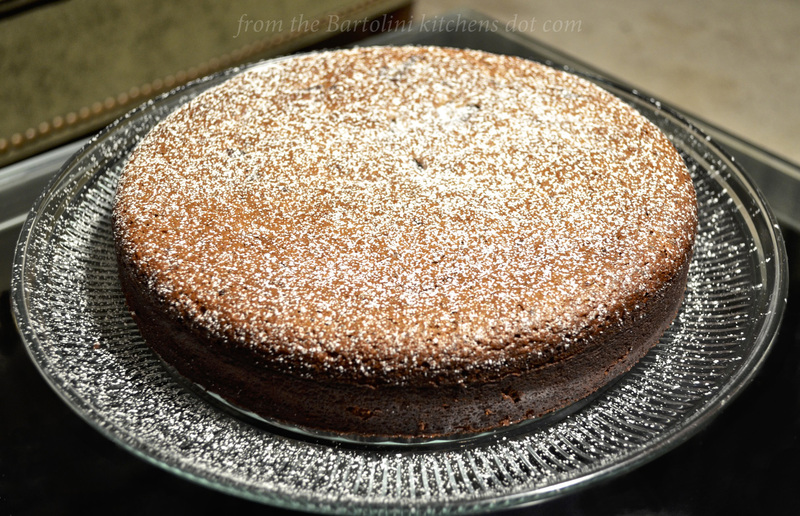 If you or your guests prefer a dessert that’s not too sweet, than serve them a piece of Zia’s cake just as she intended, with a dusting of powdered sugar on top. If, however, someone at the table would prefer something a bit more sweet, then have I got the thing for you, a salted caramel sauce. 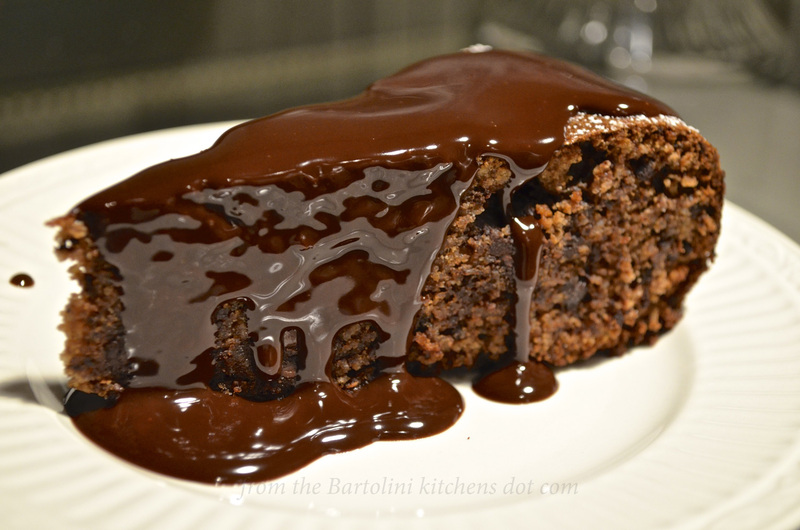 Within this post, I’ve included the recipe for the sauce and you’ll find it the perfect accompaniment for Zia’s cake. See? With or without the sauce, you really can have your cake and eat it, too. 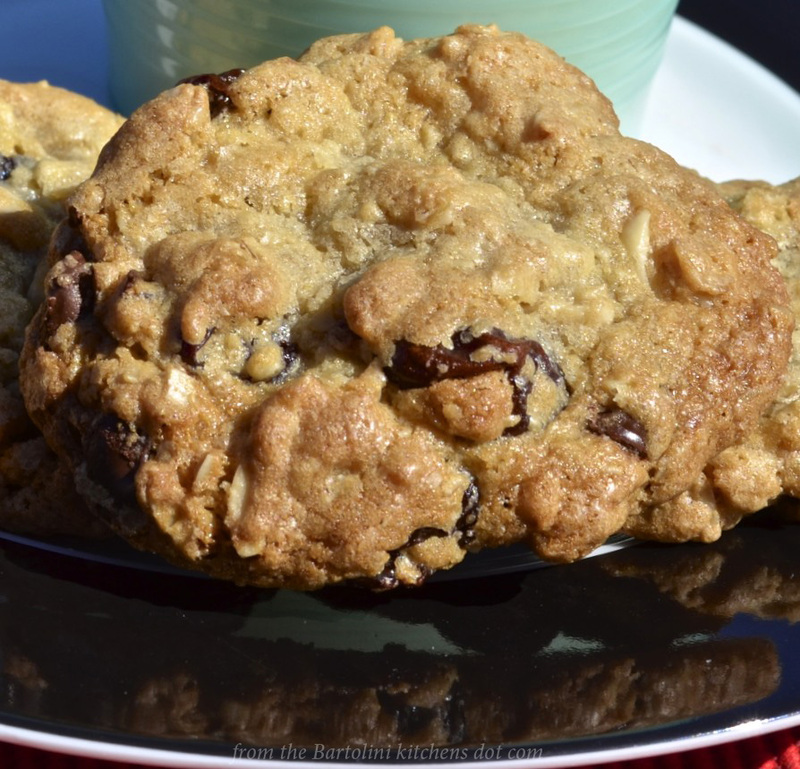 Now, as for the recipe itself, the original doesn’t specify the kind of apples, raisins, nor nuts to be used. Having just visited the Honey Man in Michigan, I had fresh Cortland apples and black walnuts at my disposal. 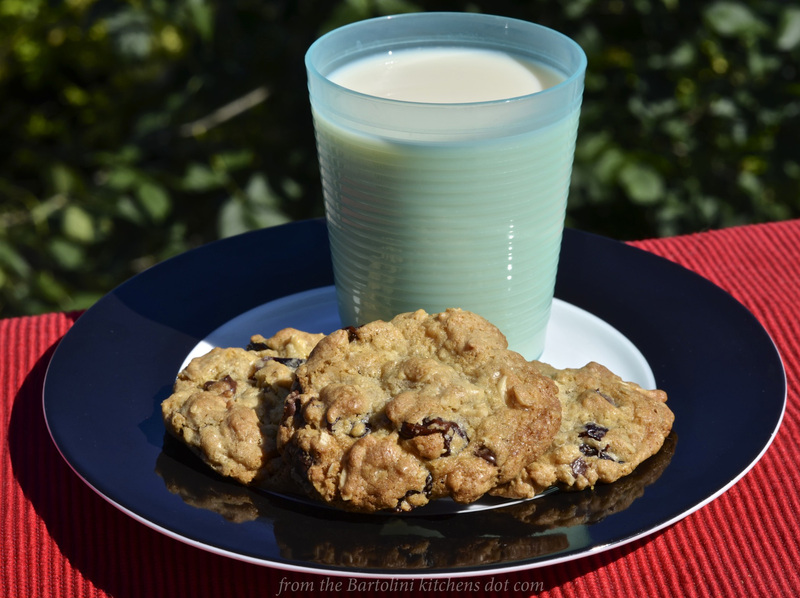 I used golden raisins simply because I had them on-hand. That’s it. The rest of the ingredients are quite common and you should have little trouble preparing this cake. I’m leaving for this year’s last visit with Zia. The Kitchens will be closed while I’m gone and will be re-opened on Wednesday, November 20th. Place all ingredients — except apples, raisins, and nuts — in a large mixing bowl. Beat with a spoon until well-blended. Batter will be stiff. Add apples, raisins, and half the nuts to the bowl and stir till evenly distributed. 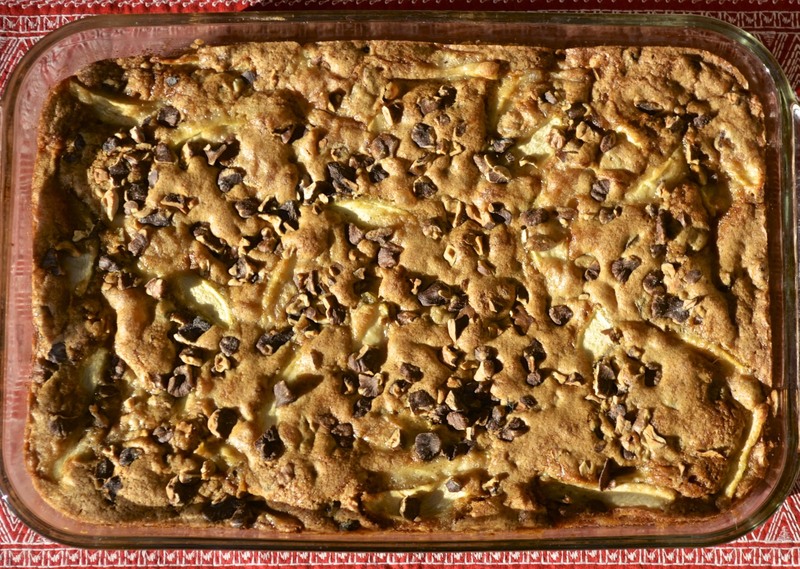 Pour batter into a well-greased 9 X 13″ baking dish. Sprinkle the top with the remaining nuts. Bake in pre-heated 350˚ oven for 45 minutes. A toothpick inserted into center should be clean upon removal. Allow to cool before dusting with confectioners (powdered) sugar and serving. Pour the sugar into a medium sauce pan (see Notes) over med-high heat. Once boiling, look for it to change to an amber color. If necessary, swirl liquid in the pan but do not stir. Once the sugar has turned amber in color, reduce heat to medium, add the butter and whisk vigorously until melted and fully blended. Remove from heat, gradually add the cream, whisking all the while. Once blended, add the salt and continue to whisk until fully mixed. 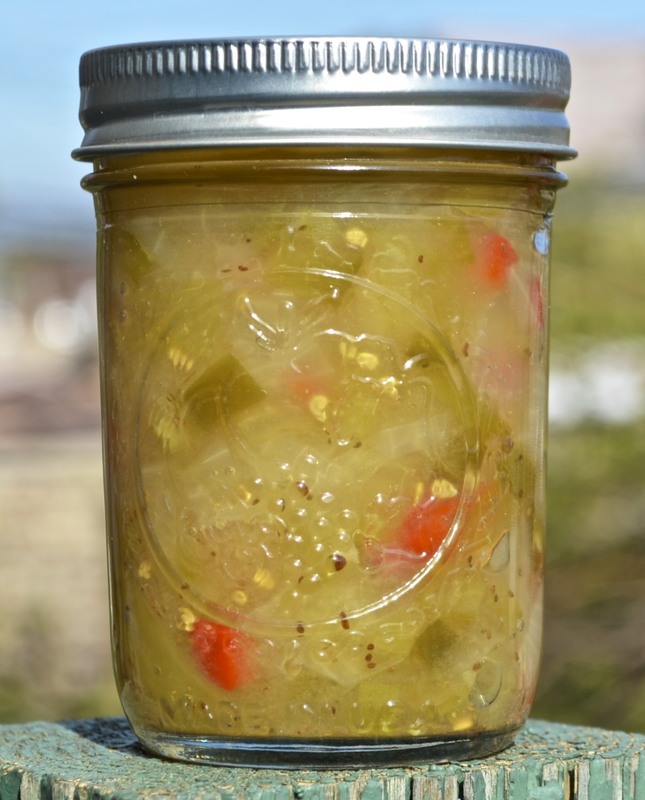 Set aside to cool for a few minutes before pouring into a sealable container for storage in the fridge, where it will keep for a couple of weeks. 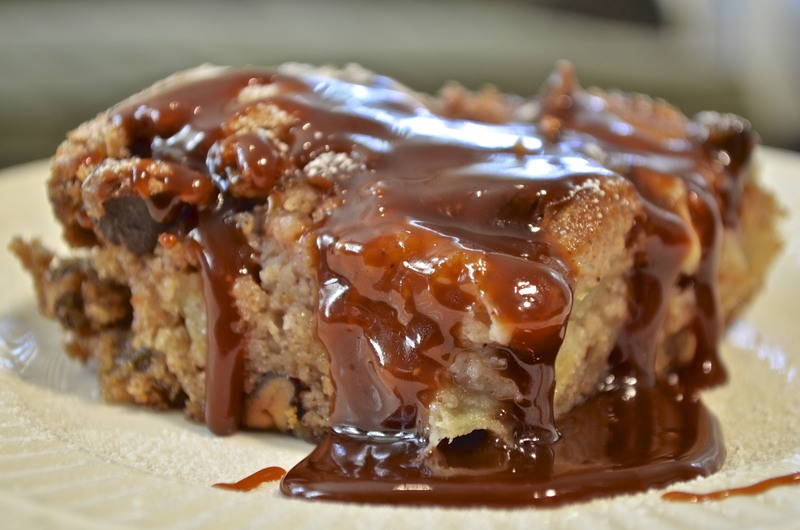 Warm before serving with your favorite dessert. The recipe will prepare salted caramel sauce. If you’re not a fan of salted caramel, reduce the amount of salt used, but do not eliminate all of it. A bit of salt is usually recommended with sweet preparations. I’d suggest using 1/8 or 1/4 tsp instead of the amount listed in the recipe. Be sure to use a large enough saucepan. The sugar will boil and could boil over if your pan is too small. You may stir the sugar as it melts but must stop stirring the moment it begins to boil. Failure to do so may result in sugar crystals ruining the texture of the finished sauce. Once almost all the sugar is melted, it’s best to put away the spoon and swirl the pan’s contents until all is melted, boiling, and begins to turn amber-colored. Do not, I repeat DO NOT catch a dropped spoon that was used to stir the melting sugar. I can tell you from personal experience that the momentary joy you may feel for actually catching something with your left hand will be obliterated by the searing pain that only sugar burns can deliver. Last Saturday, All Souls’ Day was observed in a number of Christian churches. 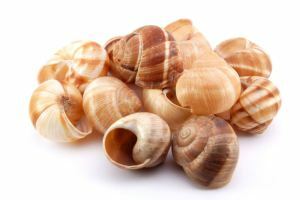 In Marche, where the Bartolini are from, it’s traditional to serve snails, lumache, on that day. Although my family never observed that custom, we did, on very rare occasions, prepare and serve lumache. If you’re interested in learning how it’s done, just click HERE. As many of you know, I spend some of my spare time watching a variety of cooking shows. (Note that I didn’t say the Food Network. Since they’ve gone to the dark side of broadcasting — a.k.a. “reality” TV — I watch that network far less.) Since I can not always watch them when broadcast, many of these programs end up recorded on my DVR. Then, on some rainy day or sleepless night, I’ll clear my DVR of these recordings, zipping through the programs hoping that something will catch my eye. That’s how I found today’s recipe and it was quite a catch, even if I do say so myself. If you’re at all like me, you enjoy the combination of blueberry and lemon flavors. After all, a blueberry muffin without a hint of lemon is just a muffin. These slices have an abundance of both ingredients and the result is one delicious treat. It’s ridiculously easy to prepare and there are no exotic nor hard-to-find ingredients. If you don’t have fresh blueberries, go ahead and use frozen. In fact, I always buy and freeze blueberries at the peak of their season, so, that I can enjoy blueberry pie when the cold weather hits. This Winter I’ll have a slice, too. If you try this recipe, I bet I won’t be the only one. Place flour, sugar, baking powder, salt and lemon zest in a food processor. Process the ingredients till thoroughly mixed. Add the egg mixture and continue to whirl until combined. Reserve 2 cups of the crumble mixture and use the rest to cover a greased 9 X 9″ baking dish. Press it down to form a crust. Meanwhile, place the blueberries, remaining sugar, lemon juice, corn starch, and a pinch of salt into a large bowl. Gently stir until everything is evenly coated. 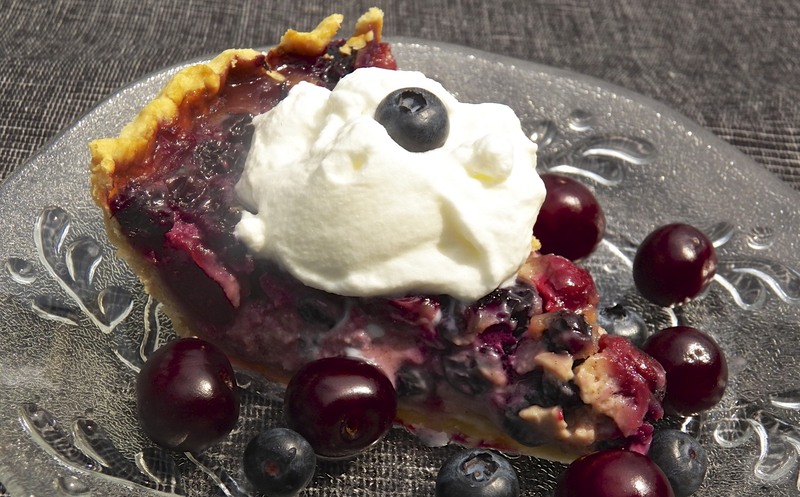 Once the bottom crust has been formed in the baking dish, pour the blueberries into the baking dish, covering the crust. 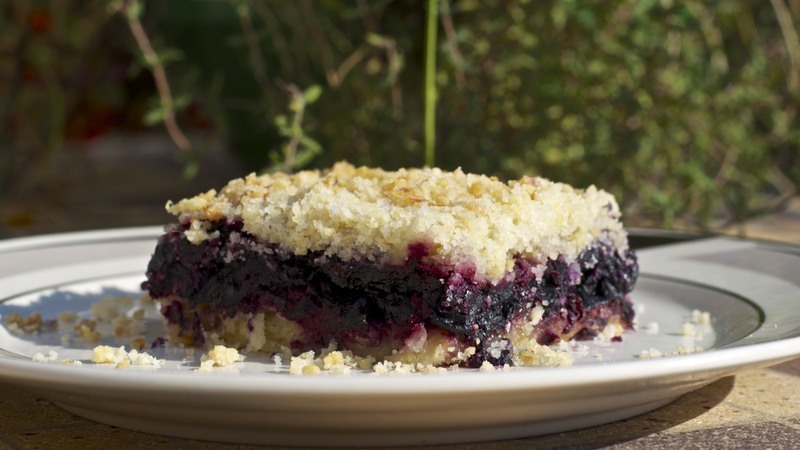 Use the reserved crumble to cover the blueberries. Bake in a pre-heated oven for 35 to 45 minutes. 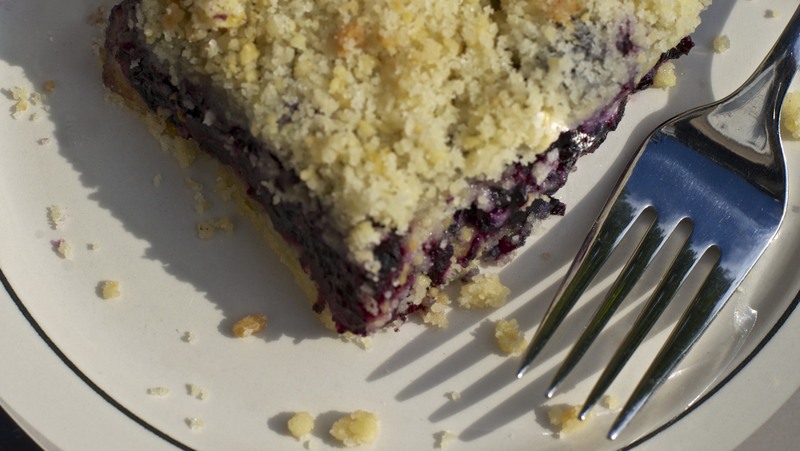 Blueberries should be soft and the crumble browned to your satisfaction. Allow to cool and set before cutting into squares. The sharp-eyed among you may notice that I used an 8 X 8″ baking dish and not the 9 X 9″ dish indicated in the recipe. My 9 X 9″ dish met an untimely end when it crashed into the floor. It was empty, thankfully. 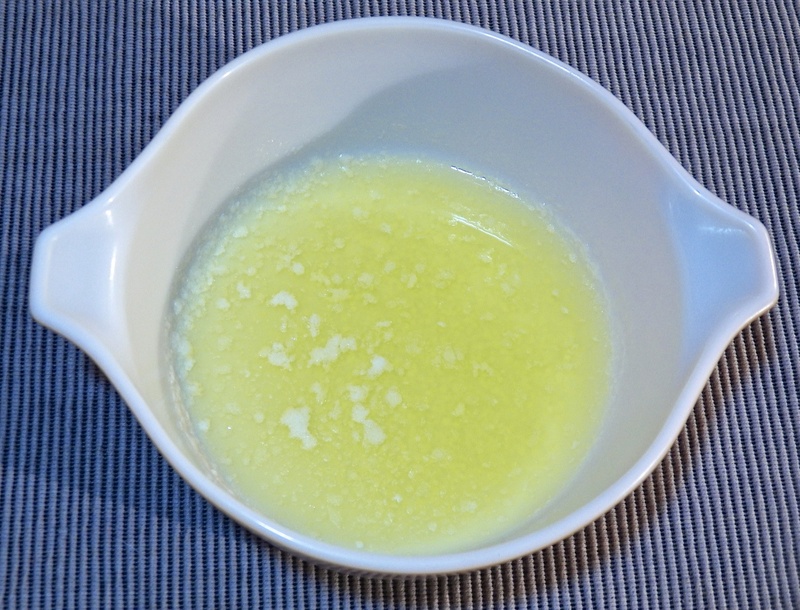 In a small sauce pan over medium heat, reduce limoncello by half. Refrigerate until well-chilled. Meanwhile, whip together heavy cream with sugar until stiff peaks form. Fold in lemon curd. When ready to serve, place a dollop of the lemon cream mixture atop each slice, accompanied by a drizzle of the limoncello reduction. 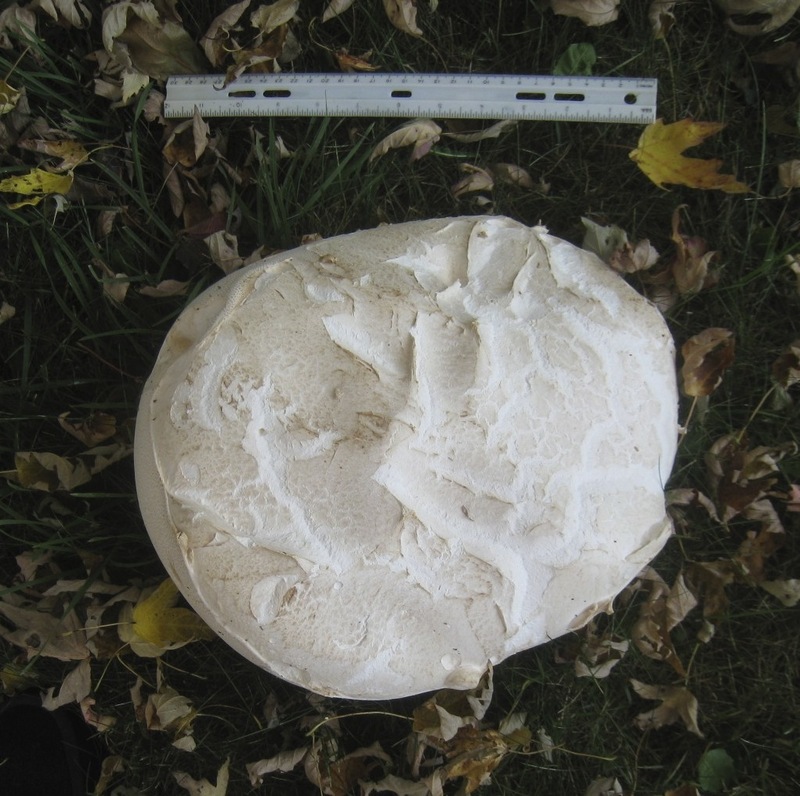 Back in our part of Michigan, it’s puffball season. Well, it’s supposed to be but you never really know until your find them. Sometime during October, these large, oblong-shaped funghi appear in areas that are mostly shaded from the sun. Up until a few years ago, 1 to 3 of them could be found behind Zia’s garage. Now, for reasons known only to Mother Nature, they’ve moved to its side. You needn’t worry about that, though, for you can find some, as well as learn how to prepare them, by clicking HERE. 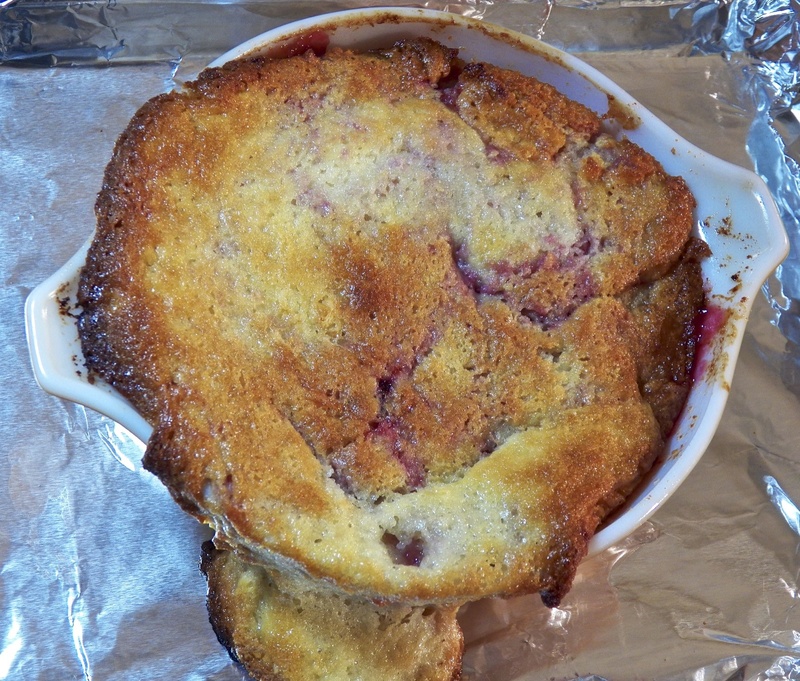 This Plum Cobbler is Magical! You may recall that I shared a peach cobbler recipe a few weeks ago. 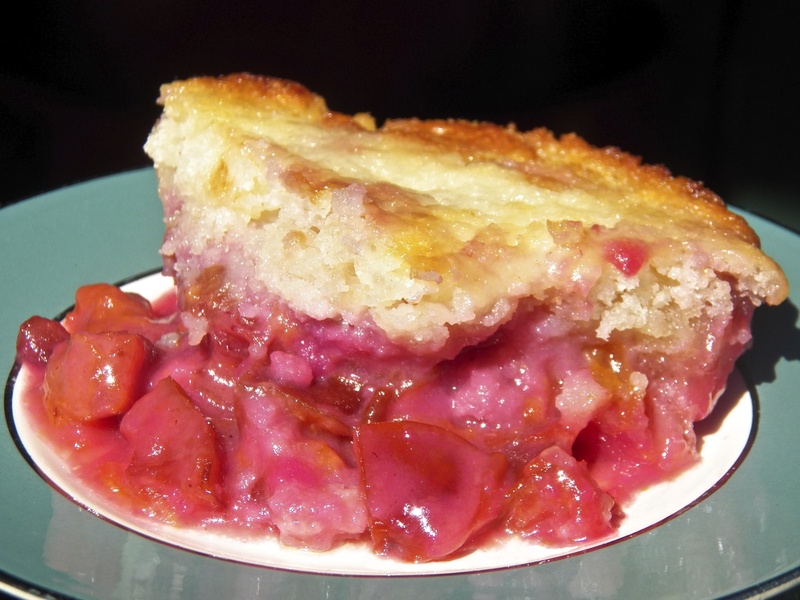 Somewhere along the line, I mentioned having another recipe for cobbler, one where the topping starts in the bottom of the baking dish but rises to the occasion during baking, giving you a perfectly formed topping to the rich fruit/berry filling. How can this be? I’ve made this cobbler more than a few times over the years. Peaches, plums, strawberries you name it, I’ve used them all. 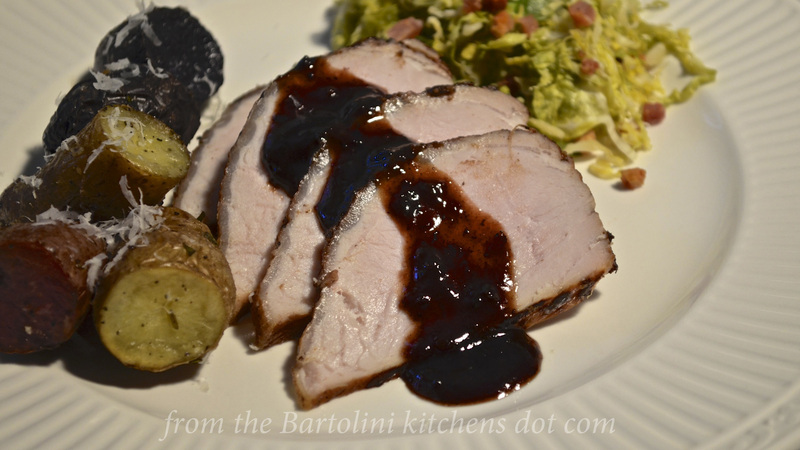 It’s an easy recipe, a fast recipe, and one that is sure to please everyone at your table. Just bear in mind that the topping of this cobbler, unlike the peach cobbler recipe I shared HERE, is more cake-like than biscuit. I happen to like them both and now you’ll have a choice. 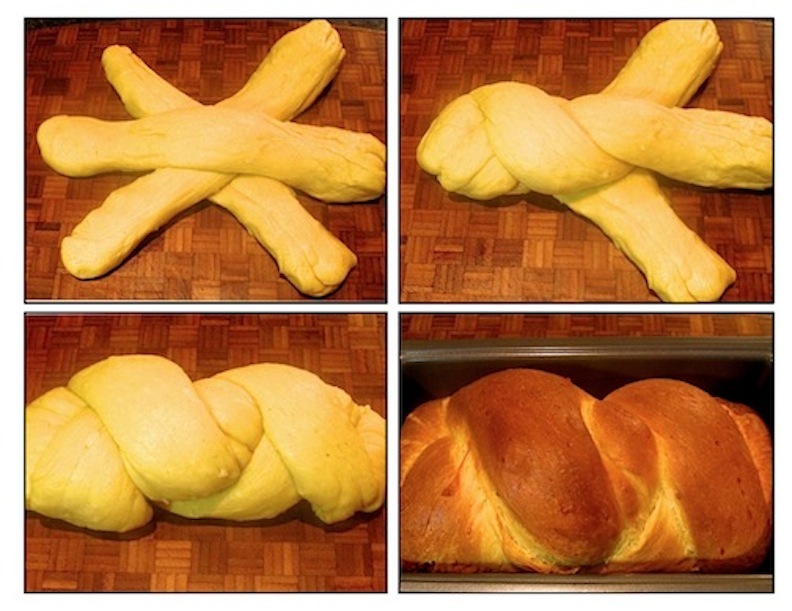 Bake while singing “Abracadabra!” and … Ecco! 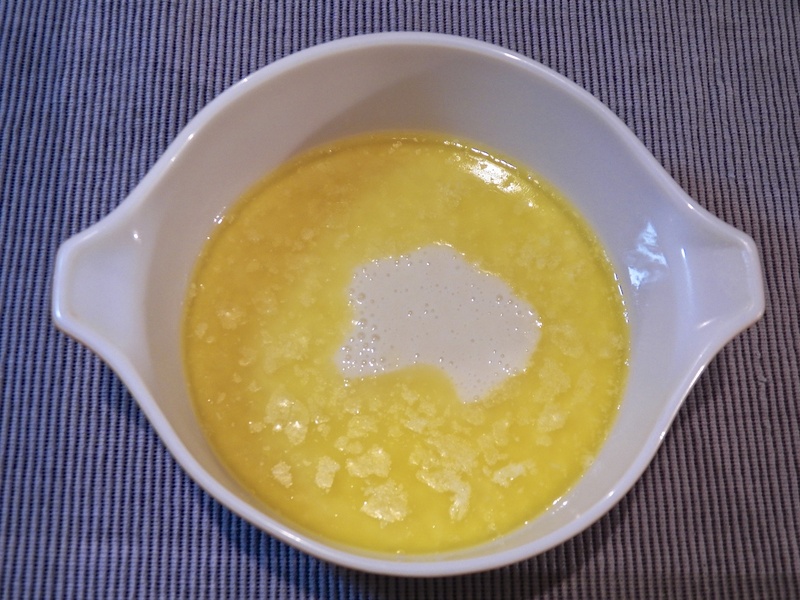 Pour melted butter into a 9 x 13 x 3″ baking dish. In a medium bowl, combine the flour, 1 cup sugar, baking powder, with salt and mix well. Add the milk, mixing until just combined. Pour this batter into the baking dish containing the melted butter. Do NOT mix. 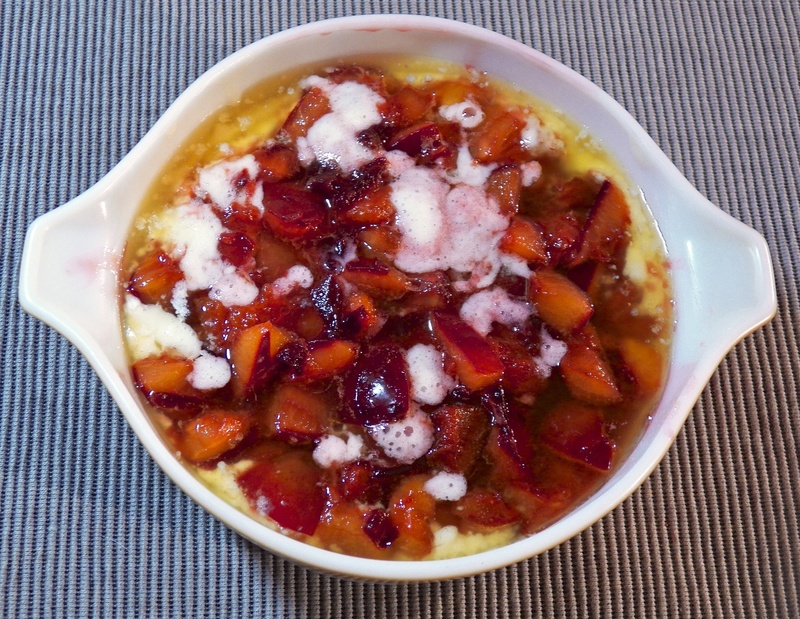 In a medium saucepan, combine the plums, lemon juice, with remaining cup of sugar and bring to a boil over med-high heat. Stir constantly. Remove from heat and add optional cinnamon and/or nutmeg. As mentioned, you can use whatever fruit or berry that you like for the filling. I’ve never used a thickening agent, like flour or cornstarch, for fear of it affecting the cake’s formation magic. Although the recipe lists cinnamon and nutmeg as optional, I rarely use them. I find that they can easily overpower a dessert, so, I use them sparingly in my cobblers, if at all. Today’s Blast from the Pasta, Spaghetti Aglio e Olio, is probably the most versatile of all pasta recipes. Prepared as written and you’ll be enjoying a delicious pasta dinner within minutes but that’s only part of the story. Saute some vegetables and you’ll have a great pasta primavera. Add some clams with a touch of white wine and you’ve got the classic pasta con vongole. The choices are endless and I prepare this dish, in one form or another, just about once a week. You can see the recipe by clicking HERE. Although I’m the proud owner of some new, fancy schmancy equipment, I am still without a DSL. I have been promised, however, that service will be restored, better than ever, sometime this evening — and companies, especially very big companies, never ever lie. Thanks for your comments and well-wishes. During the recent heat wave, I really didn’t leave the house very much. Sure, I had errands to run and a dog to walk but that was pretty much all I did outdoors for much of 2 weeks. Well, except for watching fireworks on the 4th. Yay! It was a golden opportunity to watch some cooking shows as they were broadcast, as well as a number that I’d recorded but never watched. 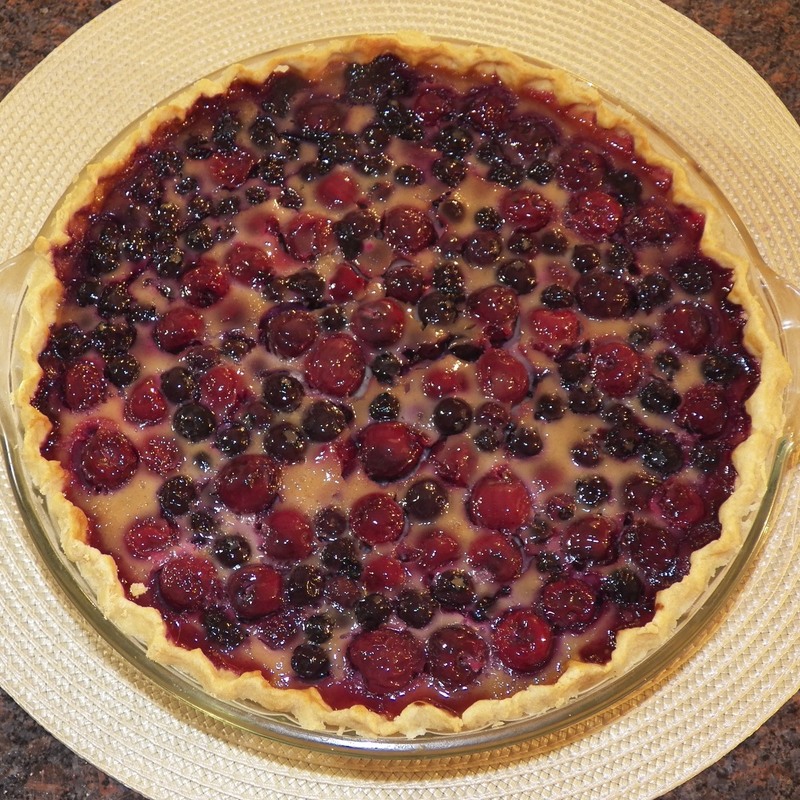 One show that I watched live was The Chew and on that particular day, Carla Hall made a cherry, blueberry, and sour cream pie. A pie with 2 of my favorite things? 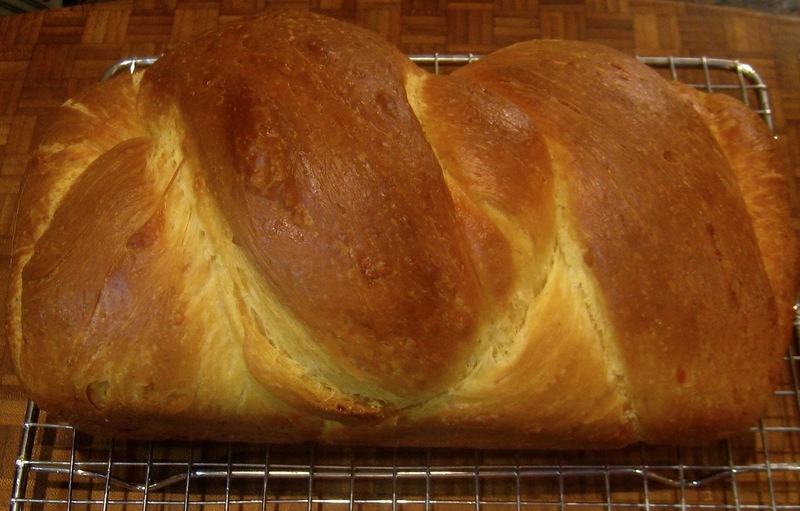 I vowed to bake one as soon as normalcy returned to our daily weather. A few days later, a Saturday, Max & I were on our way to the farmers market, where I bought sweet cherries, blueberries, and assorted other fruits & vegetables. On the way home, I stopped at a grocery and bought the sour cream needed for my pie. It wasn’t even 9:00 am and things were going very well. This all changed by 10:00 am, for that was the time I looked up the recipe on The Chew’s website. The problem was that the printed recipe was not the recipe I recalled Carla preparing. I soon found the video of her making her pie on their website — and I was right. On the video, she uses 4 eggs, while the printed version used 3. Neither version indicates where the egg white is to come from nor the type of cherry to be used. Lastly, the video shows Michael Symon adding 2 tbsp of honey to the filling while the printed version states ⅓ cup is to be used. I was on my own. My first attempt recreated the pie I watched Carla prepare. I used 4 eggs, the white of one being used to prepare the pie shell. The cherry question had been answered earlier that morning when I found sweet cherries at a good price at the market and bought a quart. And when it came to the honey, I followed Michael’s lead and used 2 tbsp. From that point forward, I followed the directions exactly and the pie was pretty good. For me, though, pretty good wasn’t what I wanted. 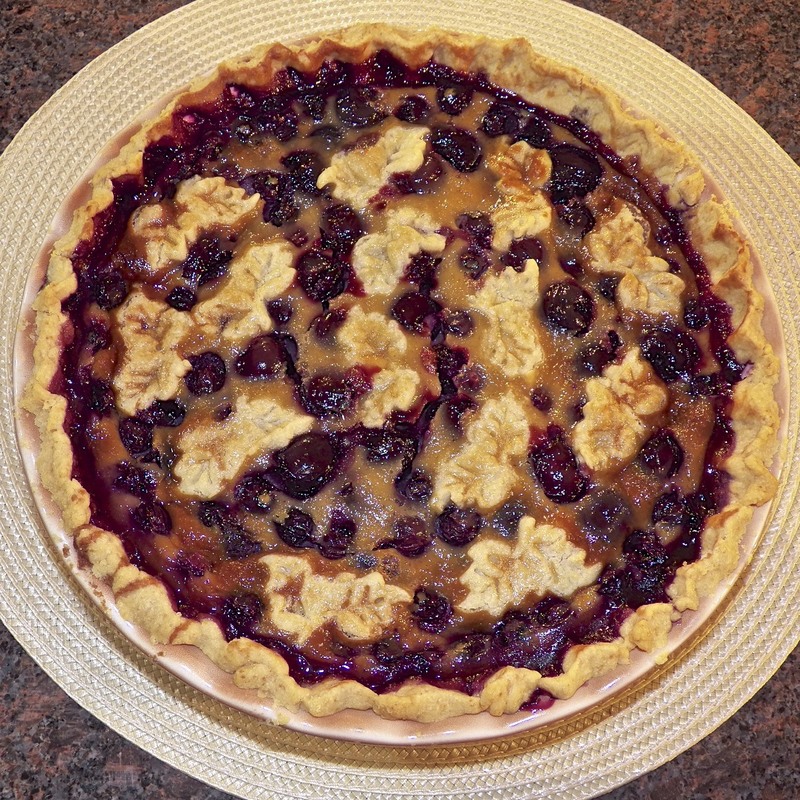 With blueberries and cherries in season, I want my pie to scream “SUMMER!” This pie said “Eggs.” Yes, eggs. It certainly wasn’t a bad pie and I’m sure that it would be enjoyed by many. It just wasn’t what I’d expected. A week passed during which I ate all that pie, sometimes with home-made vanilla ice cream, sometimes with whipping cream, sometimes plain. But I ate it all because of all the sins one can commit, the gods most frown upon those who waste pie. Another Saturday came and with it a return of the heat wave in the forecasts. Again Max and I headed to the farmers market. Again I bought blueberries and cherries, although this time I went for the tart. And again, on the way home, we stopped at a grocery to pick up sour cream. This time around, I didn’t just exchange cherries. I, also, cut the eggs in half, using only 2, and I increased the honey to ⅓ cup as the written version had indicated. 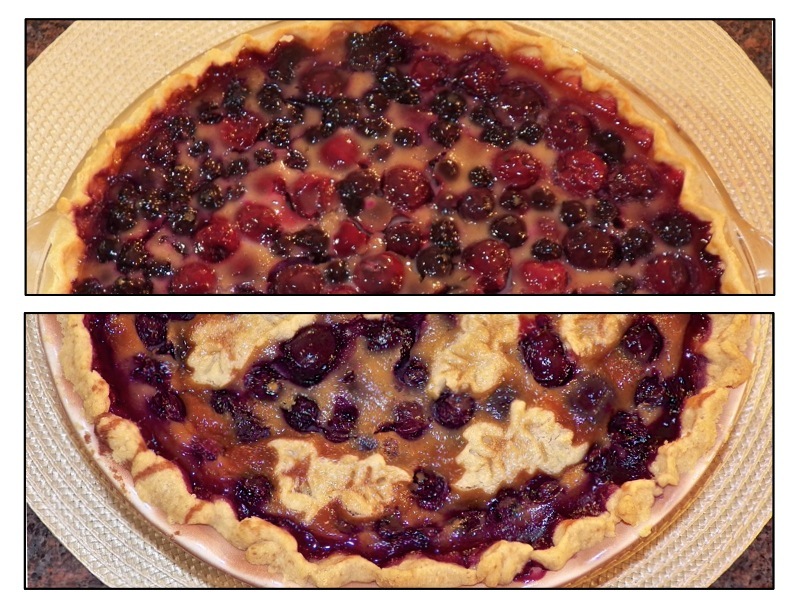 Because I wanted my new pie to take full advantage of its seasonal ingredients, I increased the amount of both tart cherries and blueberries to 2 full cups apiece. This pie was not going to even whisper “eggs”. Once the filling was made, I prepared the pie as I did the first. And the verdict? I liked this rendition so very much more than the first. As I had hoped, this one was more custard and less egg-y. 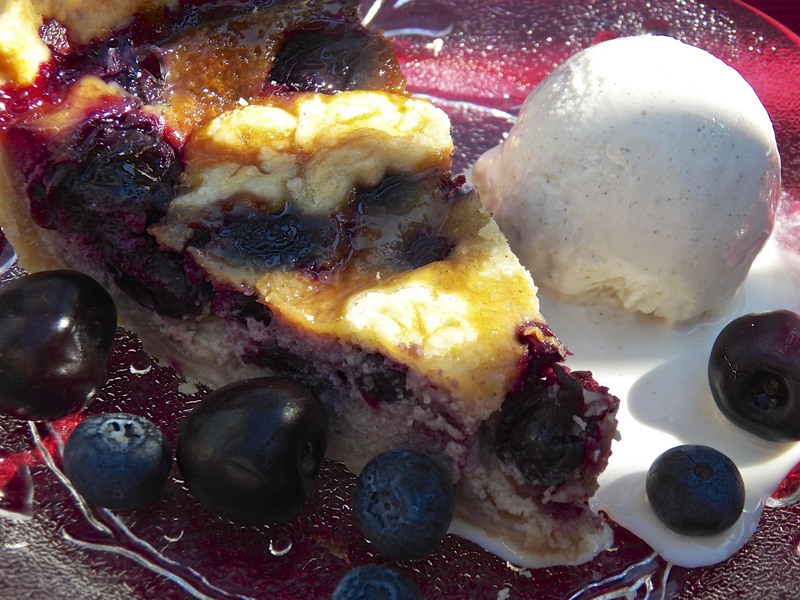 Adding more cherries & berries paid off, while using tart cherries worked better with the blueberries. But you needn’t take my word for it. Below I’ve listed the ingredient lists for both pies. 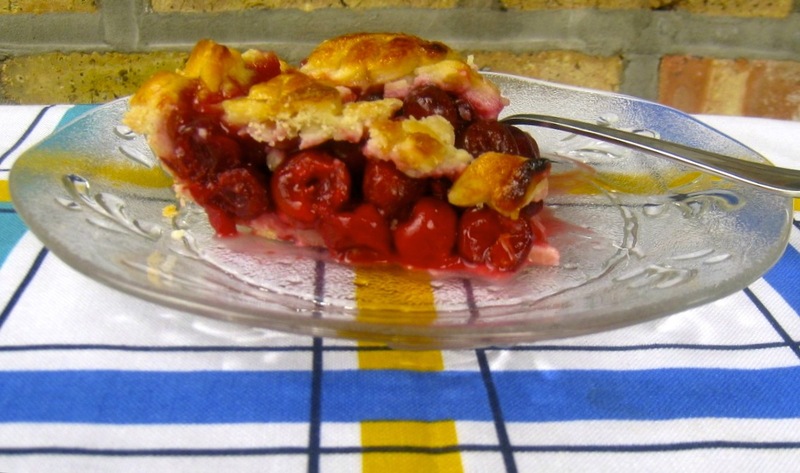 The first uses a filling with sweet cherries and most closely resembles the televised recipe. The second uses tart cherries and fewer eggs in its filling and is more closely aligned with the printed version. The directions for preparing the pie are listed once because they are the same, no matter which filling you wish to use. Make one or make them both. All I ask is that you come back here and tell us what you think or any improvements you might suggest. A single pie crust large enough for a 9 inch deep dish pie. Roll out pastry dough into a 12 inch circle and place it in a pie dish, crimp edges, and blind bake, filling the pie with pie weights or beans beforehand. After 10 minutes, remove pie crust from oven. Set aside. Lower oven temp to 350˚F. When crust is cool enough to handle, remove the pie weights/beans. Whisk together 1 egg white with 2 tablespoons of the fine sugar. Using a pastry brush, coat the pie crust before returning it to the oven. Bake for another 15 minutes or until the crust is golden. Remove from oven and cool. In a bowl, combine 2 tbsp of the fine sugar, salt, cinnamon, and nutmeg. In a larger bowl, combine the blueberries and cherries. Add the sugar combination to the berries and gently mix. In a 2nd larger bowl, combine the remaining fine sugar & eggs, sour cream, and honey. Whisk until fully blended before adding to the berry mixture. Stir to combine. Pour the filling into the pre-cooked pie shell and bake for 1 hour at 350˚F. Pie may be served warm. There’s no need to buy the superfine sugar called for in the recipe, for you can make it yourself. Just place ½ cup of regular sugar into a food processor or spice grinder and give it a go. In a minute or two you’ll have superfine sugar. In the weeks that followed, I baked a number of test pies. I varied the amount of grated cheddar cheese in the crust from 2 to 6 ounces per crust. I adjusted the amount of fat in the crusts and even swapped spices in the filling. And left in my wake was a trail of apple pies that stretched from the shores of Lake Michigan to those of Lake Huron, not to mention devoted taste testers in both locales. In the end, I settled on using 4 ounces of grated, sharp cheddar cheese and 7 tbsp of fat per crust while, in the pie filling, I replaced nutmeg with cardamom. The result was a pie with a crust that was manageable when raw and, when baked, was relatively light with the distinctive — but not overpowering — taste of cheddar. Success! With the cheddar question out of the way, let’s talk filling. Just like with our Thingamajig, I use both tart and sweet apples. For the sweet, I find that Fuji work best because they, like Granny Smiths, hold up well during baking. I prefer the apples in my pie filling to be in chunks rather than thinly sliced and that way they remain somewhat firm when baked. Once the apples are peeled, cored, and chopped, I heat them in a saucepan with some butter. All I’m doing is heating them through; I take them off the heat when their juices first begin to appear in the pan. I’ve found that this helps to prevent a finished pie that has a gap of over an inch between the apple pie filling and the crust “dome” above it. It’s important, though, to pull the apples off of the heat as soon as they start to render their juices and to cool them completely before assembling the pie. Cook them too long or fill the pie while they’re still hot and your apples will not be at all crisp when the pie has finished baking. 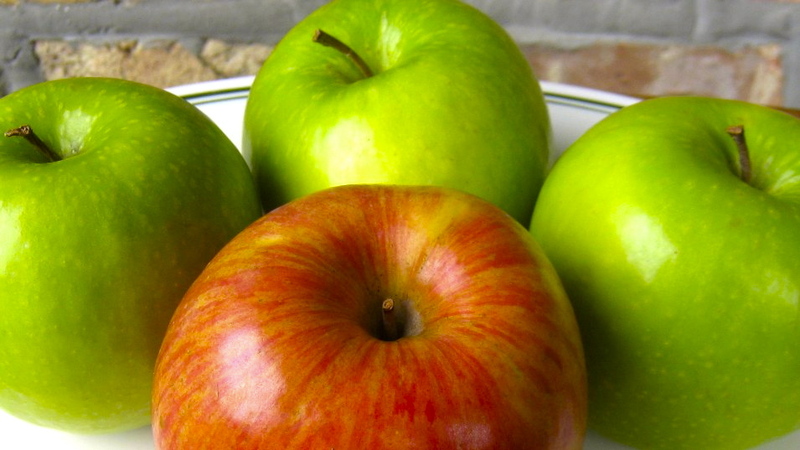 In a large mixing bowl, combine the apple slices and lemon juice. Stir to coat the apples. In a sauce pan large enough to hold the apples, melt the butter over medium heat. Add the apples and sauté just until the apples begin to give up their liquid. Do not cook until the apples grow soft. Meanwhile, in a small bowl, mix together the sugar, brown sugar, flour, cinnamon, cardamom, and salt. Return heated apple pieces to large mixing bowl. Add the raisins, if using, and spice mixture to the apples and gently stir until the apples are coated evenly. Set aside to cool completely and until the pie crusts are ready. For Pie Crust – Best if each crust is made individually in the food processor. Add flour, cheddar cheese, and salt to the processor. Pulse it a few times to combine the 3 ingredients. Add the very cold butter & shortening cubes. Pulse the machine 3 times, with each pulse lasting a 3-count. Your ingredients will now be lightly mixed. If need be, pulse again. With the machine running, add the vinegar and then slowly add the ice water. Do not add so much that a ball of dough forms. Remove the lid and, with your hands, test the dough to see if a ball of dough can be formed. If so, turn the dough until a very lightly floured service, form a ball, wrap it in plastic wrap, and refrigerate for 30 minutes. If a dough ball will not form, add a little more water, pulse the machine a couple of times, and test it again. When you can form a ball of dough, follow step A above. While the dough rests in the fridge, prepare the 2nd crust. After 30 minutes, remove the dough from the fridge and roll it until large enough to completely cover the bottom of a 9 inch pie pan. Place the dough into the pan, trim any access, and return the crust and pan to the fridge until needed further. Roll out the 2nd crust, though slightly smaller, it must be large enough to cover the pie with a little excess. 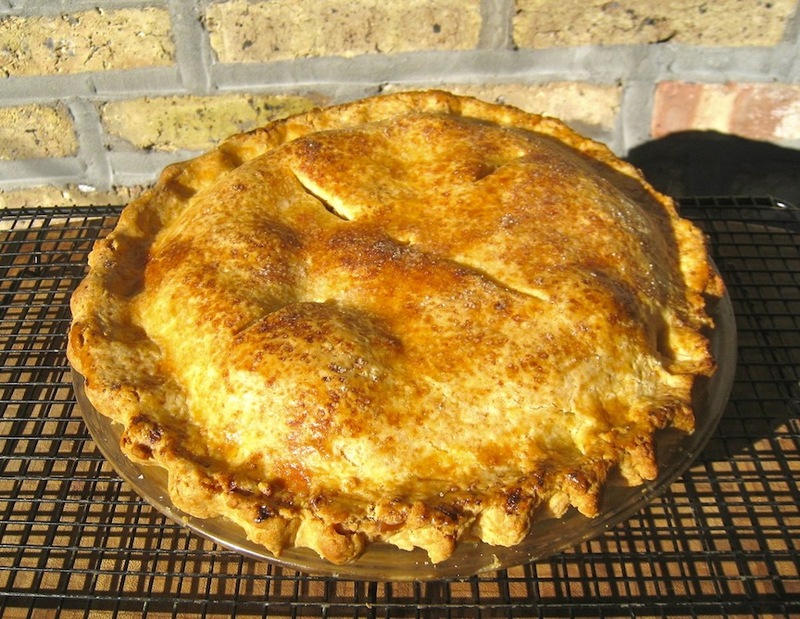 Retrieve the pie’s bottom crust from the fridge, fill it with the apple pie mixture, and cover it with the 2nd pie crust. Seal the pie by gently lifting the bottom crust’s edge while placing the top crust’s edge behind it. Work you way around the entire pie. Again, working your way around the pie, crimp the edge to further seal the pie. Use the egg to coat the top crust. Sprinkle with sugar. Use a sharp knife to create steam vents in the pie’s upper crust. Bake in a pre-heated 400* oven for 15 minutes. Without opening the door, lower the heat to 375* and continue baking for 40 – 45 minutes. After a total time of 30 minutes, and 15 minutes thereafter, check to see if the crust’s edge is too dark. If so, cover with aluminum foil and continue baking. When top is golden brown, remove pie from oven and place on a cooling rack. I always allow my apple pie to cool at least 2 hours before serving. This recipe is more concerned about the crust than it is the pie filling. So, if you prefer sweet apples, walnuts, or currants, use them. If you hate raisins, ditch them. If you don’t like or haven’t any cardamom, use nutmeg. In short, change the filling to suit your tastes. The same goes with the crust. If you find that adding cheddar to your favorite pie crust recipe makes a better pie, then please come back here and tell us about it. One last thing about the crust. Add too little cheddar and you won’t taste it; too much and the pastry dough is rendered unmanageable. And even under the best of circumstances, the cheddar cheese will affect the crust’s flakiness. So, it’s basically a trade-off. The trick is to add as much cheddar cheese flavor as you can without sacrificing too many of the crust’s better qualities. 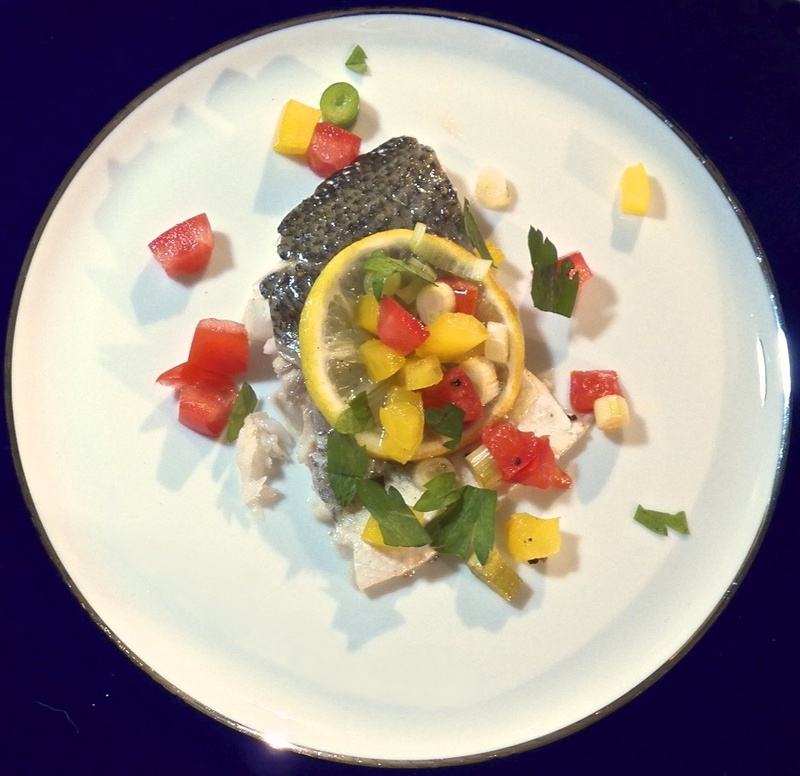 My taste testers and I agree that this recipe “works.” If you try it, I hope you feel the same way. 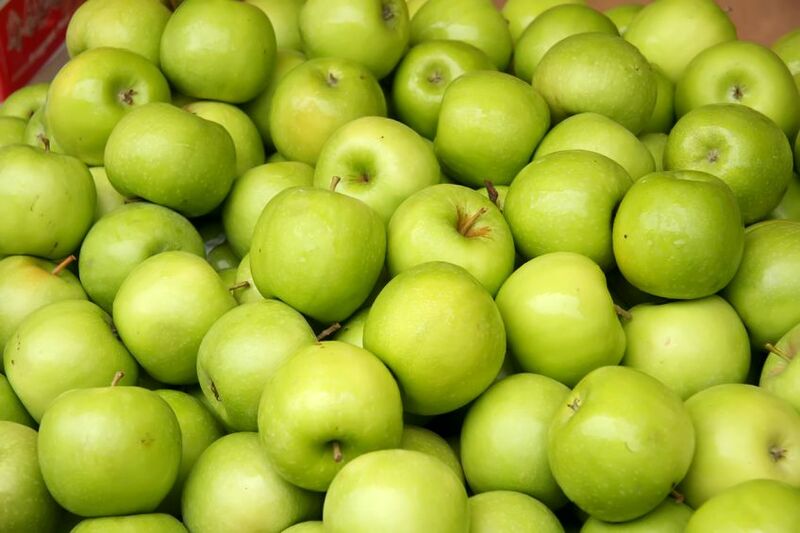 I’d planned to start this post by extolling the apple and its many uses but it’s hard to sing a fruit’s praises when there’s a thingamajig dangling atop your blog, metaphorically speaking, of course. So, I might as well explain the name of this dish and get it over with — in a minute or two. 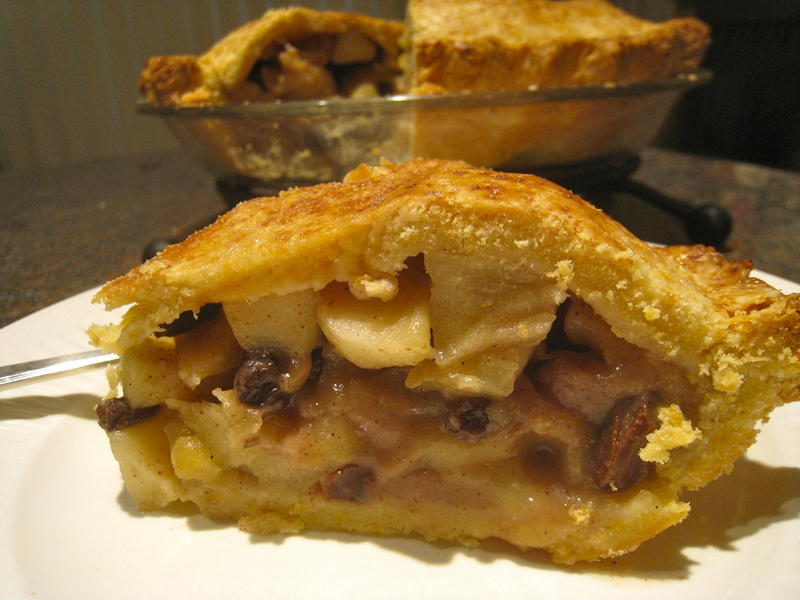 Several years ago, at about this time of the year, my cooking shows were all featuring apple pies. Now, I love apple pie but had shied away from making them because my pie crusts were terrible and the poor apples turned to mush. That Fall, I decided to teach myself how to bake a pie and, every week to 10 days, I baked an apple pie. Well, with parents who were children of the Great Depression, we learned very early on that one never wastes food. Period. So, if I made a pie, I ate a pie. True, eventually my pies got better and I was confident enough to share them with friends — but I ate a whole lotta pie before then. Still, even though I eventually settled on recipes for both crust and filling, one pie is a lot if you live alone, as Zia and I often commiserated. As a result, neither of us baked apple pie because we didn’t want to be greeted by the same pie every time we entered our kitchens for the next week or so. That was until 2 years ago. It was about that time that we both saw cooks on television prepare apples in a form that was part pie and part tart. They called them “open-faced” pies or tarts but, to our minds, they’re neither. So, we started calling them apple “thingamajigs” and the confusion ended, at least between the two of us. Best of all, an apple thingamajig is half the size of a pie and, therefore, better suited to our swinging single lifestyles. 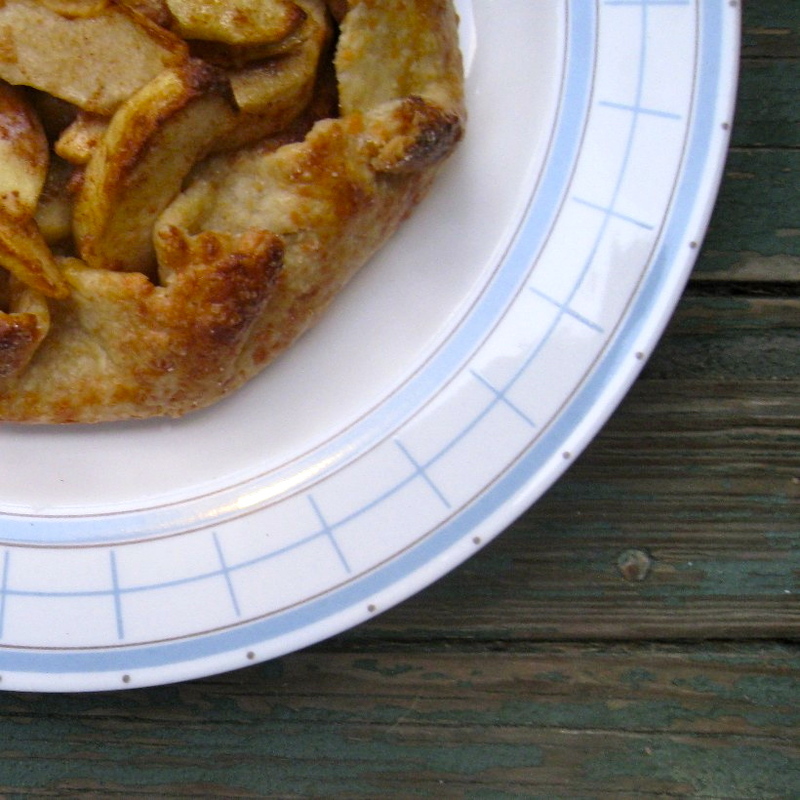 Now, there are plenty of recipes around for thingamajigs and mine is based upon my apple pie recipe, with one notable exception. I include cheddar cheese in my apple pie crust but not here. Being a thingamajig has only one crust, the cheddar cheese flavor is too mild to be noticed and adding more cheese to the recipe only serves to make the crust unmanageable. So, the cheddar is reserved for double-crusted pies and it’s probably just as well. (My apple pie recipe with a cheddar crust is forthcoming.) A thingamajig, being open-faced, is less “runny” than a normal pie due to evaporation during baking. (See Notes.) As you’ll see and much to my liking, the apple slices remain firm and more apple flavor retained. 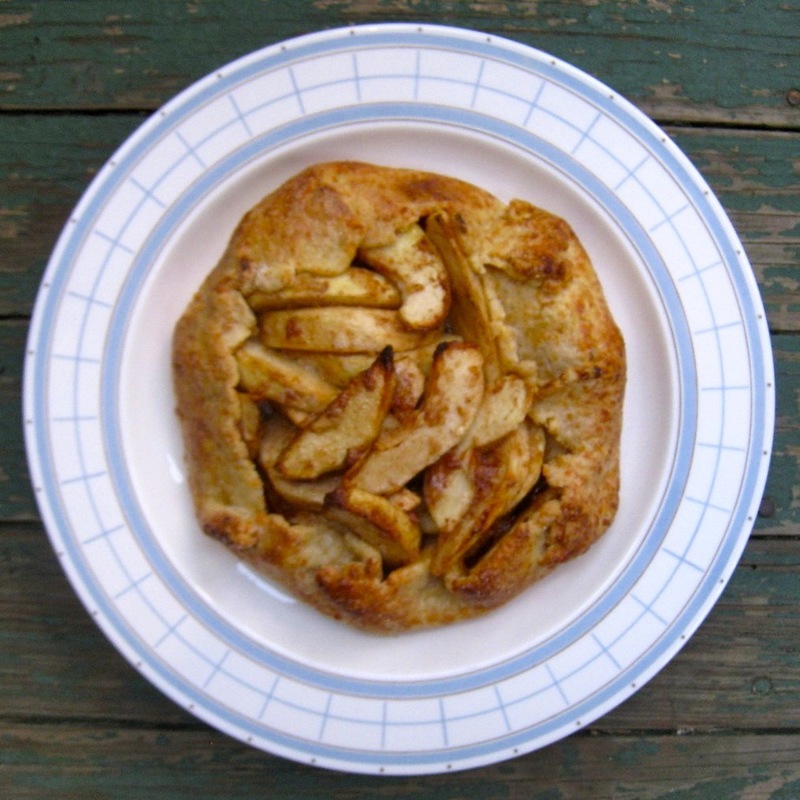 As for the apples themselves, I always use tart apples, preferably Granny Smith, but I also add a sweet one — Fuji or Honeycrisp — to the filling, usually in a 3 tart to 1 sweet apple ratio. That way, you get an occasional taste of sweet among the sour. Raisins or currants will do the same. To that end, I don’t use a lot of sugar nor a number of spices in my apple filling. 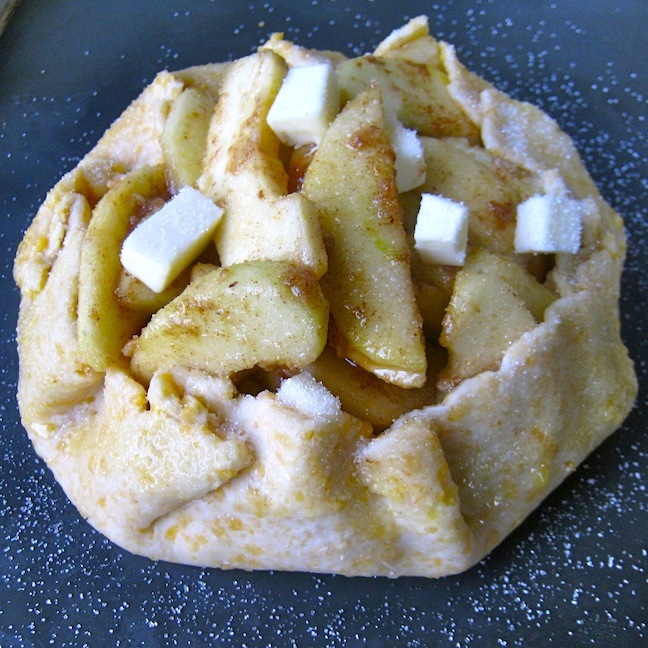 Why use tart apples if you’re going to add a ton of sugar and spice to the filling? For me, when it comes to apple filling, less is more. Add flour and salt to the processor. Pulse it a few times to mix the 2 ingredients. While the dough rests in the fridge, prepare the filling. In a small bowl, mix together the sugar, brown sugar, flour, cinnamon, nutmeg, and salt. Add the spice mixture to the apples and gently stir until the apples are coated evenly. Set aside until the pie crust is ready. Roll the dough as if making a bottom crust for a 9 inch pie. 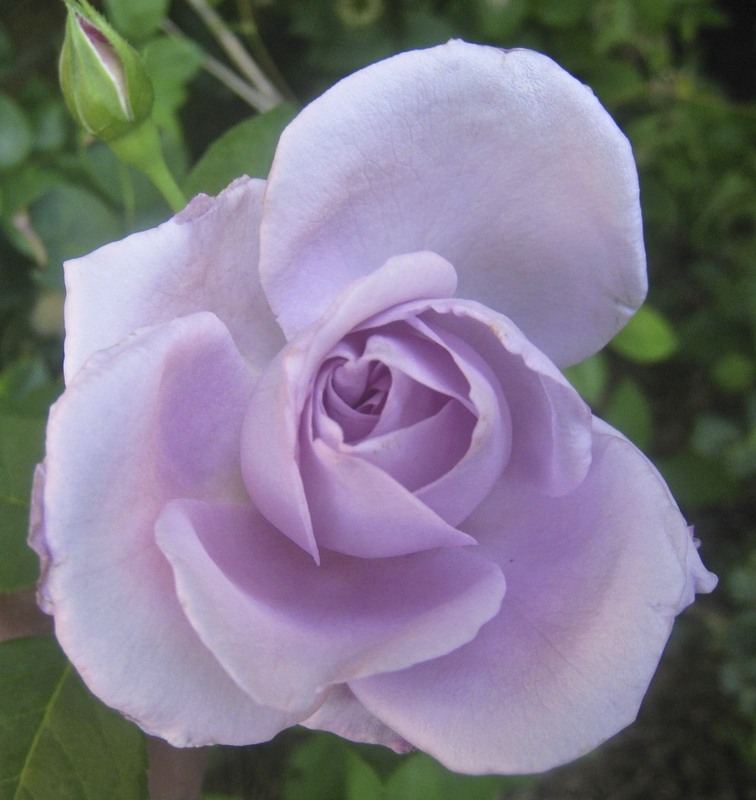 Carefully lift the border, working your way around the filling, crimping as needed. You are creating the crust for your open-faced thingamajig. Dot the top of the apple filling with small bits of butter. With a pastry brush, lightly coat the exposed crust with the beaten egg. Sprinkle the sugar. Place in a pre-heated 375* oven and bake for 40 to 45 minutes or until golden brown. Should not be served piping hot but may be served warm. Just like its cousins the tart and pie, you can add ingredients to the filling to suit your own tastes. 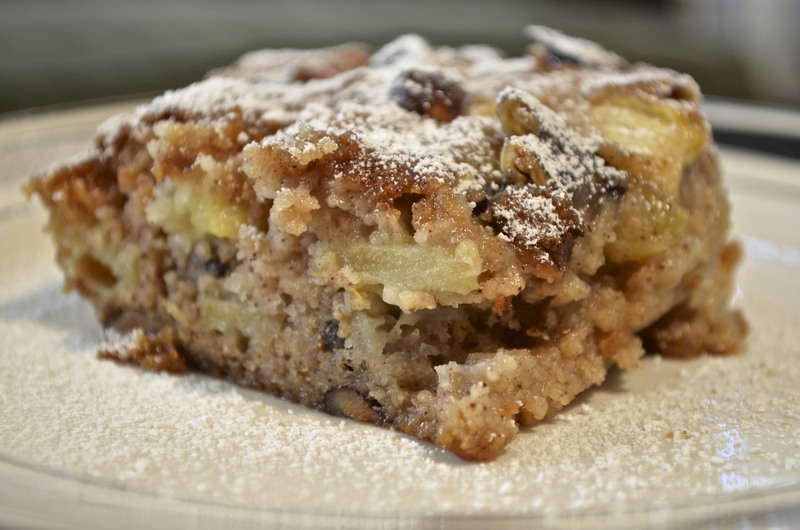 In the past, I’ve added raisins, currants, and chopped walnuts to the filling and enjoyed each. And, of course, you can change this dessert completely by selecting different apples. I like tart; you may prefer sweet. Lucky for us, there are plenty of apples to choose from. I’ve used both of these recipes for several years now. The first, for pastry dough, uses a food processor to mix the dough. That alone makes it a winner in my book. The recipe, however, makes only enough pastry dough for one 9 inch pie crust. I’ve found that I get better results if I make 2 batches of dough, rather than doubling the recipe for a double-crusted pie. Don’t ask me why but that’s just the way it works. The recipe for the pie filling is about as simple as can be. Flour, not cornstarch or tapioca, is the thickening agent and there’s no need to pre-cook the fruit filling mixture before placing it into the pie shell. So, if you’re good working with pastry dough, you can have a pie in the oven pretty quickly. Me? It’s an afternoon project, often including wailing, the gnashing of teeth, and the rending of garments. 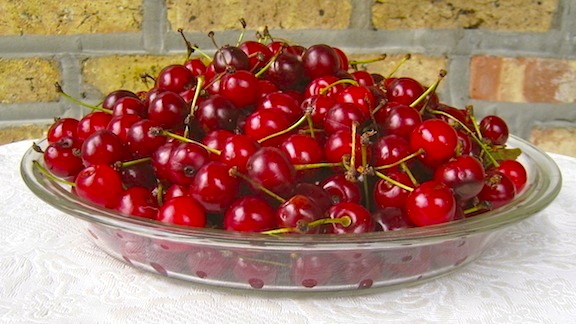 There is one last thing to consider, especially if you, like me, tend to throw common sense out the window when you see all the pretty quarts of tart cherries lined up in the market or at some farmer’s stand. I mean, how can you not buy a few quarts? It all makes perfect sense until you arrive home and realize that you have to pit them all before you can do anything else with them. Well, there is hope for us. 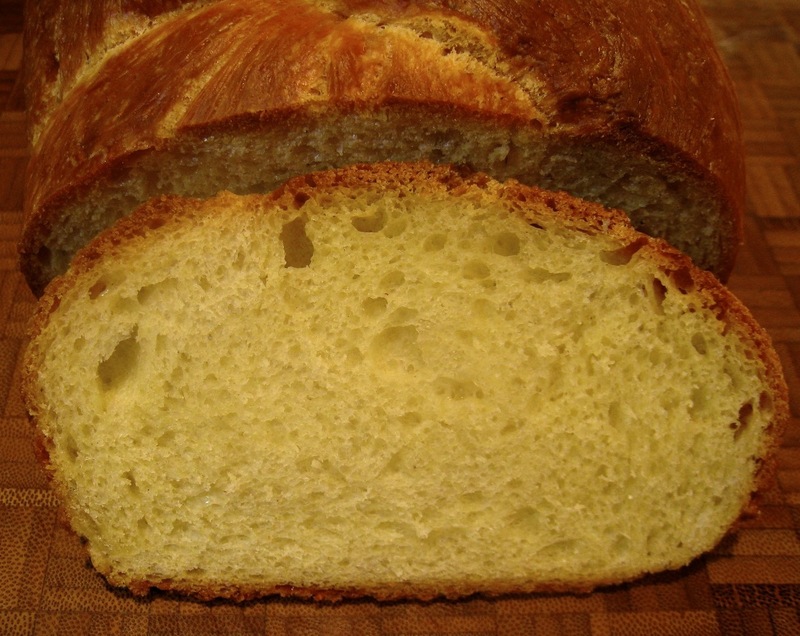 I’ve found a website that should be called “How to deal with the fruit and stuff that result from ChgoJohn going to a farmers’ market.com?” It has been called, instead, Kraft Foods something or other and it explains how to freeze a variety of baked goods. You can reach it by clicking here and I recommend that you bookmark the site. It’s one of those web pages that you probably won’t need today, you may not need tomorrow, but you are going to need it some day. Do not over-process the dough. Use only enough water to create a crumbly texture. Do not run the processor long enough to form a dough ball. Use your hands to do that. Add the very cold butter and shortening cubes. Pulse the machine 3 times, with each pulse lasting a 3-count. Your ingredients will now be lightly mixed. With the machine running, slowly add the ice water. Do not add so much that a ball of dough forms. Remove the lid and, with your hands, test the dough to see if a ball of dough can be formed. I usually postpone handling the 2nd pie crust, the “top,” until just before it is needed. The colder the dough going into the oven, the flakier the crust coming out. Pastry for 1 double-crust 9 inch pie. Use half of the pastry dough to line the pie plate. Place it in the refrigerator to chill until needed. Gently combine the cherries, sugar, flour, salt, and almond extract. Roll out the other half of the pastry and prepare for use. If covering the entire pie, leave as is. If creating a lattice, cut the strips. If, as I did, you’re creating leaves, use a stamp to form them all, place on a baking sheet lined with parchment paper, and refrigerate until needed. Pour the cherry mixture into the chilled pie shell and dot the pie with the cubes of butter. If covering the entire pie, spread the top portion of the pastry dough, seal its edge with the bottom’s dough, crimp the edge, and create slits in the top to allow steam to vent. 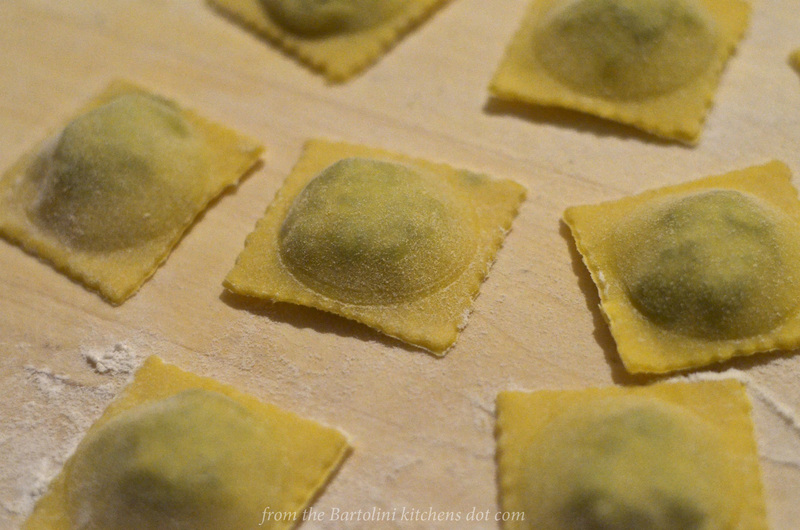 For a leaf top, place the dough leaves across the top, being careful to leave enough openings for steam to vent. Use a pastry brush to coat the upper crust with milk. Sprinkle the top with a light dusting of sugar. Bake on a baking sheet — in case of overflow — in a pre-heated 425* oven for 35 to 40 minutes until golden. Allow to cool before serving so that the filling sets properly. "... And let's have another piece of pie." 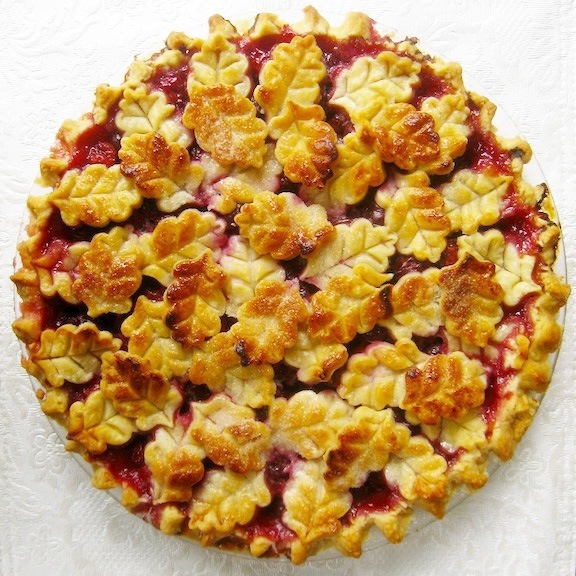 The reason one sees so many lattice-topped cherry pies is because a woven top allows the pie’s juices to evaporate somewhat during the baking process, making for a better pie. Cook’s Illustrated Magazine’s book, Baking Illustrated (p. 148), suggests creating the lattice on parchment paper and not atop the pie. Once woven, place both the lattice and parchment paper in the freezer. When the lattice is firm, gently transfer it from the paper to the pie’s top and carefully connect it to the bottom crust. Brush it with milk, sprinkle with sugar, and bake as directed above. And so ends this year’s journey down Cherry Lane, where pitting is such tart sorrow.